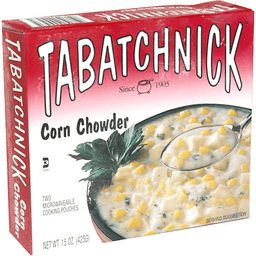 Tabatchnick™ Thick & Creamy Corn Chowder. Wholesome quality. Since 1905. All natural. Only 130 Calories. See nutritional information. Two microwaveable cooking pouches. 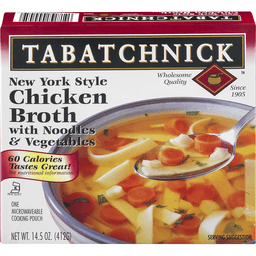 Since 1905, the Tabatchnick family has taken great pride in producing a wholesome soup made with only the finest and most natural ingredients. Four generations later, this century-old tradition continues. We comb the world for the highest quality ingredients worthy of the Tabatchnick name. We only use our own natural and pure artesian well water, and never add any preservatives, artificial ingredients or MSG. Following in the footsteps of our great grandmother, our products are made in small batches and simmered slowly, always under the watchful eye of a Tabatchnick. Great Grandma would be proud! The Tabatchnick family. Visit our website: www.tabatchnick.com. 80 calories and tastes great! We comb the world for the highest quality ingredients worthy of the Tabatchnick name. We only use our own natural and pure artesian well water, and never add any preservatives, artificial ingredients or MSG. Following in the footsteps of our great grandmother, our products are made in small batches and simmered slowly, always under the watchful eye of a Tabatchnick. Great Grandma would be so proud! 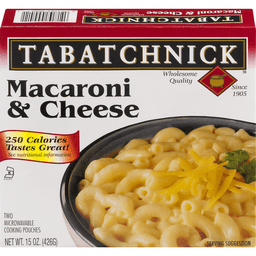 Tabatchnick™ Macaroni & Cheese. Wholesome quality. Since 1905. 250 calories tastes great! See nutritional information. Two microwavable cooking pouches. 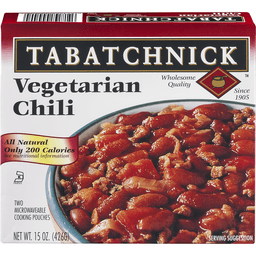 Since 1905, the Tabatchnick family has taken great pride in producing a wholesome product made only with the finest of natural ingredients. We will settle for nothing less, making our products worthy of the Tabatchnick name. Only our own pure and natural artesian well water is used as the base for our fine soups, and we never add any preservatives, artificial ingredients, or MSG to our products. Four generations later, this family tradition continues! Following in the footsteps of our great grandmother, our products are made in small batches and simmered slowly, always under the watchful eye of a Tabatchnick. Great Grandma would be proud! The Tabatchnick family. Visit our website: www.tabatchnick.com. One microwaveable cooking pouch. 35 Calories, tastes great! 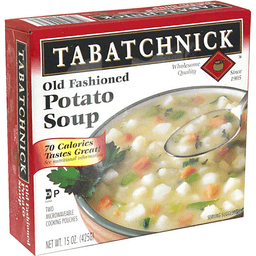 Since 1905, the Tabatchnick family has taken great pride in producing a wholesome soup made with only the finest and most natural ingredients. Four generations later, this almost century-old tradition continues. We comb the world for the highest quality ingredients worthy of the Tabatchnick name. We only use our own natural and pure artesian well water and never add any preservatives, artificial ingredients or MSG. Following in the footsteps of our great grandmother, our products are made in small batches and simmered slowly, always under the watchful eye of a Tabatchnick. Great Grandma would be proud! We personally guarantee your satisfaction. After all, our name and reputation depend on it. So enjoy! Wholesome quality. Since 1905. 180 Calories tastes great! Two microwaveable cooking pouches. 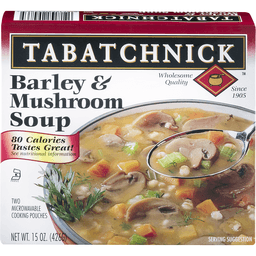 Since 1905, The Tabatchnick family has taken great pride in producing a wholesome soup made with only the finest and most natural ingredients. Four generations later, this almost century-old tradition continues. We comb the world for the highest quality ingredients worthy of the Tabatchnick name. We only use our own natural and pure artesian well water, and never add any preservatives, artificial ingredients or MSG. Following in the footsteps of our great grandmother, our products are made in small batches and simmered slowly, always under the watchful eye of a Tabatchnick. Great Grandma would be proud! Two microwaveable cooking pouches. 120 Calories, tastes great! 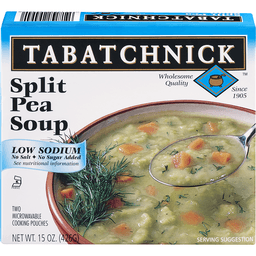 Since 1905, the Tabatchnick family has taken great pride in producing a wholesome soup made with only the finest and most natural ingredients. Four generations later, this almost century-old tradition continues. We comb the world for the highest quality ingredients worthy of the Tabatchnick name. We only use our own natural and pure artesian well water, and never add any preservatives, artificial ingredients or MSG. Following in the footsteps of our great grandmother, our products are made in small batches and simmered slowly, always under the watchful eye of a Tabatchnick. Great Grandma would be proud! We personally guarantee your satisfaction. After all, our name and reputation depend on it. So enjoy! 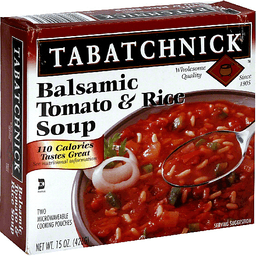 Tabatchnick™ Soup Balsamic Tomato & Rice. Since 1905. Wholesome Quality. 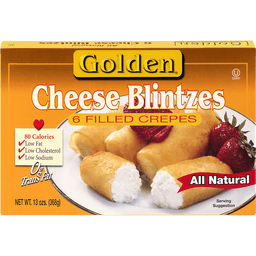 All Natural And Gluten Free. Only 110 Calories. 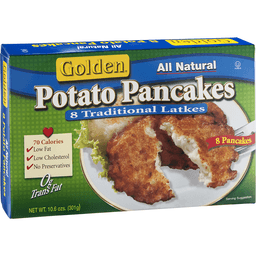 Two Microwavable Cooking Pouches. Net Wt. 15 OZ. (426G). 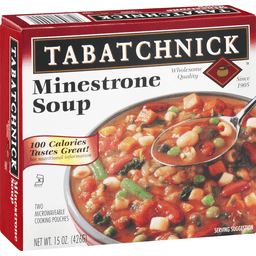 Since !905, the Tabatchnick family has taken great pride in producing a wholesome soup made only with finest of natural ingredients. 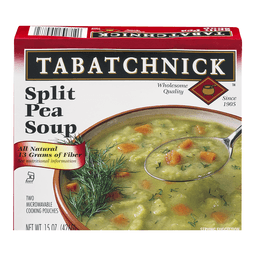 We will settle for nothing else, making our products worthy of the Tabatchnick name. Only our own pure and natural artesian well water is used as the base for our fine soups, and we never add any preservatives, artificial ingredients, or MSG to our products. Four generations later, this family tradition continues! Following in the footsteps of our great grandmother, our products are made in small batches and simmered slowly, always under the watchful eye of a Tabatchnick. Great Grandma would be proud! Visit our Website www.tabatchnick.com. No salt added; no sugar added. Two microwaveable cooking pouches. 110 calories and tastes great! We comb the world for the highest quality ingredients worth of the Tabatchnick name. We only use our own natural and pure artesian well water, and never add any preservatives, artificial ingredients or MSG. Following in the footsteps of our great grandmother, our products are made in small batches and simmered slowly, always under the watchful eye of a Tabatchnick. Great Grandma would be proud! 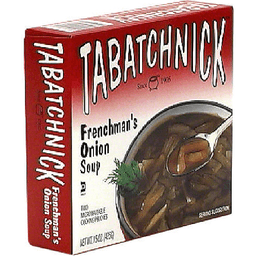 Tabatchnick™ Soup Frenchman's Onion. Since 1905. Wholesome Quality. All Natural. Only 60 Calories. 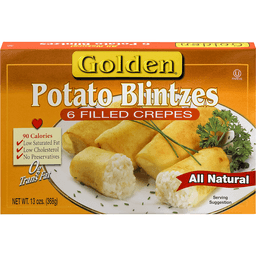 Two Microwavable Cooking Pouches. Net Wt. 15 Oz. (426g). 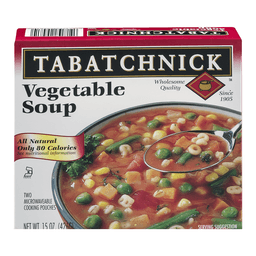 Since 1905, the Tabatchnick family has taken great pride in producing a wholesome soup made only with the finest of natural ingredients. We will settle for nothing less, making our products worthy of the Tabatchnick name. Only our own pure and natural artesian well water is used as the base for our fine soups, and we never add any preservatives, artificial ingredients, or MSG to our products. Four generations later, this family tradition continues! Following in the footsteps of our great grandmother, our products are made in small batches and simmered slowly, always under the watchful eye of a Tabatchnick. Great grandma would be proud! The Tabatchnick Family. www.tabatchnick.com.